How to Free Convert FLV to MP3 on Mac? Do you have some FLV video files downloaded from various video sites like YouTube, Dailymotion, Yahoo, Vevo, Vimeo, Hulu, Metacafe, etc.? Have you wanted to get the ear-catching audio extracted from these FLV videos so that you can play them back on you iPod, cellphone, music player or use them as ringtone/BGM? The best way you have is to convert FLV to MP3 on Mac. Why is that? MP3 is basically a format of listening to music is short for MPEG (Moving Pictures Experts Group) Layer 3. It is similar to WAV but is compressed to 1/10th the size while maintaining comparatively high sound quality. Songs in MP3 format can be downloaded from online music websites, generated from recorded music, digitized from analog media and, in this this post, we are going to focus on MP3 being extracted from FLV video files. Then how could you free convert FLV to MP3 music? All you need is good FLV to MP3 converter software. You don’t know where to find them? Via search engine, there are tons of tools you can find that can do the work. But are they all worth a try? Can they be reliable? Actually it is risky to try them one by one due to potential malware threat. So here we recommend All2MP3 for Mac to solve the problem once and for all. 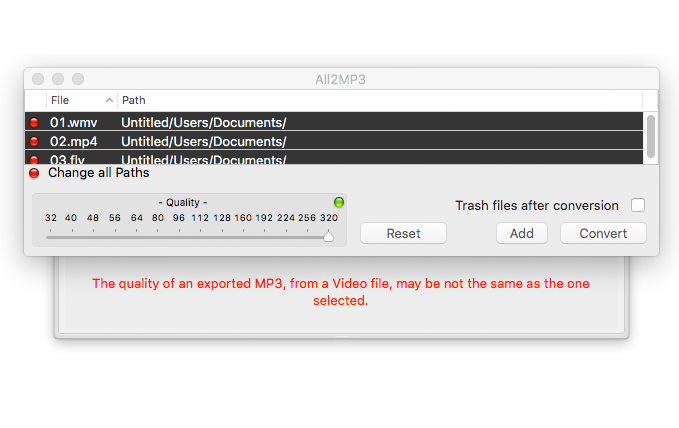 All2MP3 for Mac is a simple yet powerful Mac video & audio to MP3 converter, working stably on Mac OS X 10.12 Sierra/El Capitan/Yosemite/Snow Leopard and lower versions. It is able to work like an audio extractor to convert FLV to MP3 and several other audio formats without loos of quality. Using this free FLV to MP3 converter, you can get the FLV to MP3 conversion job done within 3 steps. 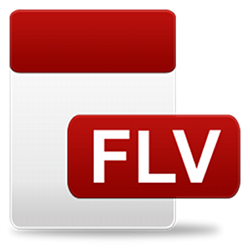 You can get this free FLV to MP3 converter for free now. How to free convert FLV to MP3 on Mac with All2MP3 for Mac exactly? Quality adjustment is necessary if you want the output MP3 is in the exact quality you want. But for most users changing quality can be difficult. All2MP3 for Mac provides several quality presets that you can choose (bitrates ranging from 32 to 320 KBps/s). Keep in mind that the higher the bitrate is, the better the sound quality will be & the bigger the file size will be. Mostly, online converters provide poor quality. And most risky thing is that they require you to upload your video/audio files first and this may lead to unauthorized access and data leakage – that is definitely the last thing you want if the media files you upload are private or supposed to be confidential. Convert all video formats (350+) to widely accepted MP4 video format with top speed and optimal video & sound quality. Download video from YouTube, Dailymotion, Facebook, Yahoo, Hulu and more and convert downloaded videos to MP3 for audio playback. Download video from 300+ video sharing websites like YouTube, Dailymotion, Facebook, Yahoo, Vevo, Vimeo, Metacafe, etc. and convert them to video/audio/device formats you want.